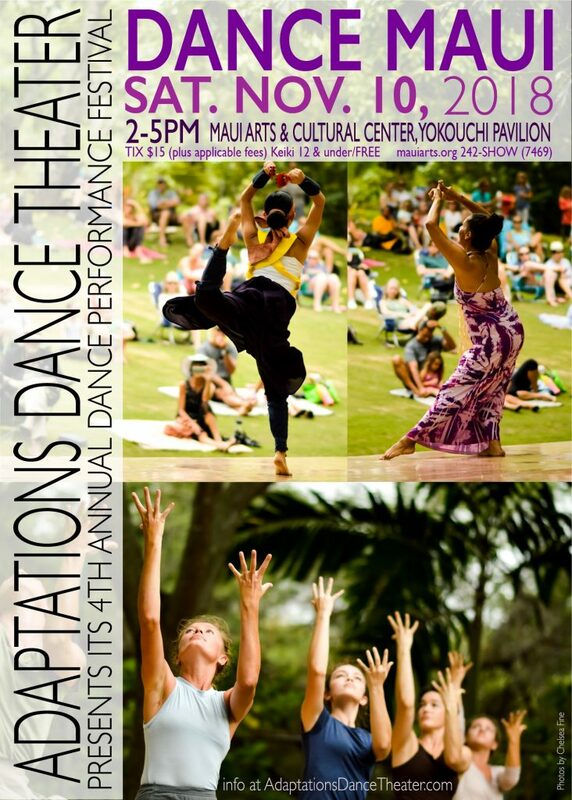 Tickets are now on sale for the Adaptations Dance Theater’s annual dance performance festival, Dance Maui, on Saturday, Nov. 10 at the Yokouchi Pavilion at the Maui Arts & Cultural Center from 2 to 5 p.m.
Dance Maui celebrates the many culturally-diverse dance organizations of Maui by bringing them together on a single stage to perform their art as one dance community. Dance Maui at the MACC, Nov. 10, 2018. PC: Adaptions Dance Theater. Audiences of all ages are invited to enjoy this family-friendly afternoon of dance outdoors. Tickets are $15 plus applicable fees, and kids 12 and under get in free. This will be the first year that Dance Maui will be held at the Maui Arts and Culture Center. After holding the festival for its first three years at Keōpūolani Park, this year’s move to the MACC is one that organizers hope will increase the festival’s visibility. “By moving the festival to the MACC, it opens the doors to bringing in more artists from across the Hawaiian Islands, and eventually the rest of the country,” said ADT Co-founder Nicole Humphrey, who has served as the company’s executive director and Dance Maui festival director for the past three years; Humphrey recently moved to the mainland and continues to serve ADT as a board member. 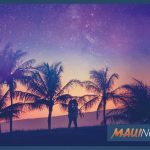 “Much like Jacob’s Pillow Dance Festival in Massachusetts, or Vail Dance Festival in Colorado, we have always envisioned Dance Maui to become a world-renowned festival, not only representing the diversity found within our island, but attracting others from across the globe to share their art with our beautiful Maui community,” said Humphrey. 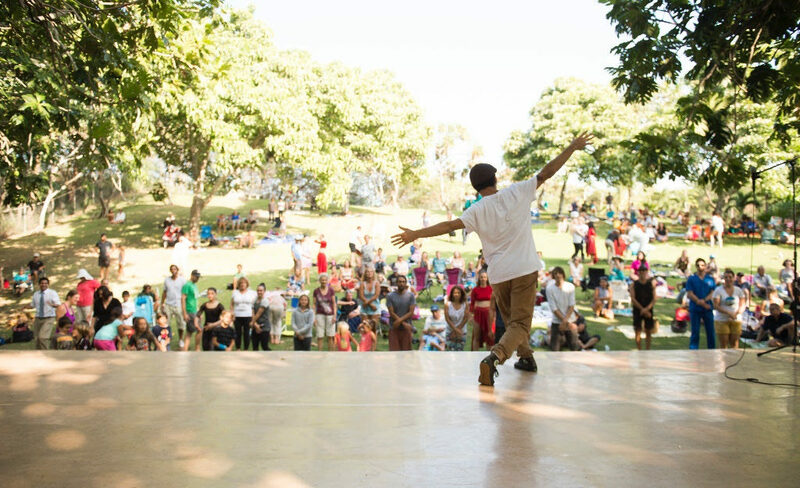 Amidst its international aspirations, Dance Maui maintains its commitment to creating a performing arts event that is both community-centered and welcoming to families. The Yokouchi Pavilion offers a panoramic view of the West Maui mountains, allowing one of the island’s most historic landmarks to serve as the natural backdrop to complete the outdoor performance experience. The almost 360-degree view of the stage from anywhere along the MACC courtyard and lawn makes it easy for people to move around as needed during performances without fear of disrupting their fellow audience members. 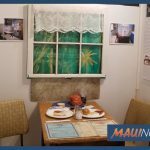 “Hosting the festival outdoors allows entire families to enjoy an afternoon together experiencing something fresh and new, while simultaneously soaking in the beauty of Maui that everybody yearns for on the weekends. You don’t have to choose! Dance Maui provides it all here for you,” said Jen Cox, ADT’s interim executive director. The 2018 Dance Maui lineup includes well-known Maui artists who have been with the festival since its inception, like Darshan Dance Project, Akari Dance, and the festival’s host, Adaptations Dance Theater. Several newcomers from Maui and beyond are also joining the festival this year, including featured guest artist Kimberly Miguel Mullen. Mullen is a classically trained folkloric dance artist and cultural ethnologist whose dance practice is rooted in ritual dance expressions from AfroCaribbean/AfroBrazilian religious systems of deities called the Orichas/Orixas. The Los Angeles Times has described her dancing as “spectacularly supple” since she infuses her dances with a remarkable ability to embody, interpret, and transmit the character of the archetypes of the AfroCuban and AfroBrazilian deities. “Kimberly travels the world teaching, performing, and mesmerizing audiences with her unique ability to remake and reframe AfroCuban and AfroBrazilian traditional forms while remaining true to the legacies of the practitioners, performers, and communities that have mentored and molded her. We are honored to have Kimberly share her craft on the Dance Maui stage,” said Cady Cox, Dance Maui’s new festival director. Adaptations Dance Theater; Darshan Dance Project; Akari Dance; Maui Aerial Arts; 808 Breakers; Sacred Dance Path; Brilliant Dance Care, LLC; PureMotionZ Dance; Maui Belly Dance Company; SeaFire Entertainment LLC; Maria Teresa Houar; The Soma Aina Project; Village Pulse Drum and Dance Ensemble; and Kimberly Mullen. Akari Ueoka of Akari Dance is one the original participants of Dance Maui, performing the energetic Japanese dance called Izanai Yosakoi for the past three years. 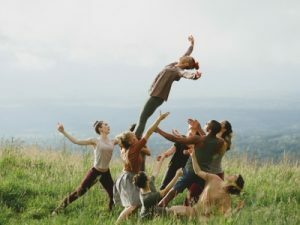 For 2018, Ueoka asked her friend and ADT Co-Artistic Director Hallie Hunt to join her in Ueoka’s performance called “Musuhi”, demonstrating another facet of this valued festival: encouraging connection and collaboration between Maui’s dancers. “As a contemporary dancer, it has been an honor and a challenge to delve into a whole new culture of dance. The movement is athletic, rhythmic, and celebratory; I am inspired to let all this new information inform my own future work as a contemporary dance choreographer,” said Hunt. Tickets to Dance Maui are on sale now at MauiArts.org. Tickets can also be purchased by calling (808) 242-SHOW or visiting the MACC box office during business hours.